Kingston men’s first team took a massive dent in their race for the title after losing 2-1 to league leaders St Mary’s University fourth team away. 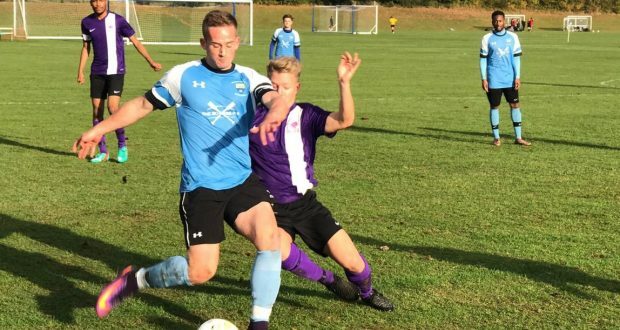 They are now five points away from St Mary’s in the BUCS South Eastern 4C league , meaning their chances of winning the league have been reduced dramatically, and Captain Sam Pledger was disappointed with this as well as his team’s performance. He said: “Really bad result. We needed to win today to stand any chance of winning the league. We just weren’t good enough. “Again, in the last two games, we just haven’t worked hard enough. We’ve been flat all game. First few games of the season, we started quick, we were quality. “Today I just thought we were really average, another bad result and now it’s just turned into another pretty average game which is disappointing because I think we’re good enough to win this league. St Mary’s scored from a low shot into the right corner but Kingston equalised with a beautiful goal from Andy Souja who beat a defender, cut inside and, with his left foot, planted the ball into the top corner. St Mary’s second goal came just before half time with a headed effort that frustrated the away team because, in the lead up, a St Mary’s striker pushed Jaden Potts but no foul was given by the referee. In the last few minutes, Kingston came very close to another equaliser, when Mo Sesay turned on the beat a player and taking a long shot that hit the bar and bounced down. Pledger said: “We looked quite good in the first half. We were on top of them. They were the ones arguing with the ref. We were moving the ball nicely at times. But despite from dishing some blame out to the referee, Pledger admits his team were not good enough on the day. “And then we came out the second half and we hadn’t done anything, we hadn’t done enough to win the game, we hadn’t created any chances, anything. “We’re the first team and they were ten yard passes going astray. Sounds basic but we’re not playing as a team at all. We don’t talk enough. Next week Kingston will play away to Imperial College London’s second team, who are currently sitting in second spot in the league.